On Nov. 4, President Yuschenko issued a Declaration of National Emergency saying, "People are dying. The epidemic is killing doctors. This is absolutely unprecedented and inconceivable in the XXI century. . . . The conclusions of the National Security and Defense Council of Ukraine, . . . show that . . . unlike similar epidemics in other countries, three pathogens of viral infections came to Ukraine at the same time: two of them are seasonal flu and the third is the A/H1N1." "According to virologists," Yuschenko continued, "such a combination of infections due to mutation may produce a new, even more aggressive virus. . . . That's why I have addressed the United Nations . . . to take timely preventive measures. . . ."
The President then declared vaccinations as "the only way to prevent any infection." Yuschenko assailed his political rival, Prime Minister Yulia Tymoshenko, for not forcing people to get vaccinated, and for holding a political rally, despite a ban on public gatherings fearing H1N1 transmissions, in advance of their January presidential election. "I am not vaccinated," Tymoshenko said. "I am protecting myself like everybody, with lemon, onion, garlic, everything that is needed. I think the best way is simply to protect your health through well-known means." Taras Berezovets, an adviser to Tymoshenko, told TIME MAGAZINE that Yushchenko, and the other presidential candidates, are using the swine-flu epidemic as an opportunity to attack the Prime Minister. "The media is to blame for the panic," Berezovets said. "From the beginning, the government has told people to remain calm and follow some simple rules." Alternatively, Yushchenko has urged people to get vaccinated immediately, and blamed his rival, Tymoshenko, for low vaccination rates across the country. "People have stopped getting vaccinated against extremely dangerous infections: tuberculosis, diphtheria, etc, the President said. "This led to high risk of A/H1N1 infection spread, when the virus came to Ukraine, and made impossible preventive vaccination against both strains of seasonal flu. . . ."
Such statements are outrageously ignorant, according to vaccine experts, since low vaccination rates against unrelated illnesses have zero impact on the spread of H1N1 or flu prevention. Worse, Yushchenko said nothing about cases of "Hemorrhagic Pneumonia" in the Ukraine that have WHO experts concerned they may be dealing with a combination of H1N1 and severe acute respiratory illness (SARS), or even Ebola genes in a new flu strain, creating a bloody global threat. "I demand the Government to immediately cancel the existing order of registration of medical supplies, including vaccines," Yushchenko directed, claiming his political opponents had allowed "various dealers to bring to Ukraine dubious medicines." The mystery of Yushchenko, urgently mandating scarce vaccinations, yet canceling existing contracts with untrustworthy vaccine suppliers, is perplexing. Experts are wondering whether he was including Baxter Corporation in his decree. 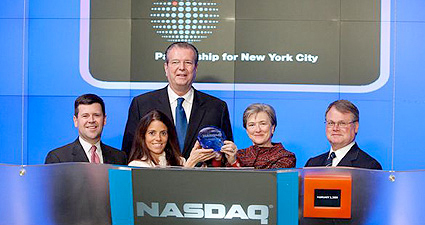 Baxter is a leading H1N1 vaccine supplier, has blood products contracts with the Ukraine, is distrusted for spreading bioweapon-grade H5N1 in regular flu vaccines to labs throughout Europe earlier this year; and transmitting the AIDS virus, HIV, worldwide in contaminated blood products during the 1980s. In August, 2009, a former microbiologist with Israeli intelligence, Joseph Mosse, made international news claiming Baxter agents would release a horrible new bioweapon in the Ukraine around this time. 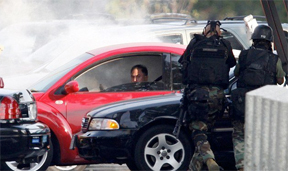 He was arrested in Los Angeles after allegedly threatening the Obama White House. According to Mosse, Baxter would spread the deadly new bioweapon in a vaccine, and that it would contain genes from the 1918 Spanish Flu virus that may cause hemorrhaging in the lungs. Dr. Leonard Horowitz, a Harvard-trained investigator of such conspiracies involving government contracts and the drug industry believes Yuschenko's statements reflects either "gross ignorance and criminal negligence, or extreme genocidal malfeasance." "Yuschenko is skirting reports of 'Hemorrhagic Pneumonia,' the vaccine bioweapon predicted by Mosse to be released by Baxter, along with gross conflicting financial interests between news media outlets including Reuters and News Corp. and the top H1N1 vaccine suppliers," Dr. Horowitz said. If genetic tests being conducted by experts for the WHO confirm the presence of the 1918 Spanish Flu in this new strain causing hemorrhaging, Dr. Horowitz says, that incriminates Dr. David Sencer, previously with the U.S. Centers for Disease Control (CDC) who dug up that virus in 1997 for vaccine research and allegedly prevention of this kind of plague. Furthermore, Yuschenko has misplaced his faith in fraudulently studied, unsafe, and ineffective H1N1 vaccines that have been improperly tested neglecting placebo controls so as to perpetuate the myth alleging their safety, Dr. Horowitz contends. Horowitz has been warning people for months about these risky vaccinations producing deadlier recombinations. 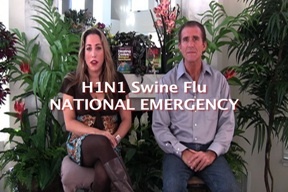 In April, as the first cases of "Mexican Swine Flu" were being reported, he posted a Special Report on YouTube explaining the emerging H1N1 pandemic as a "seeding" of the world's population by British influenza chiefs Dr. James Robertson and Dr. John Wood on behalf of their conflicting interests in the drug cartel operating through the World Health Organization (WHO). More recently, Dr. Horowitz warned YouTube viewers that President Obama's Declaration of National Emergency is, likewise, provably genocidal. "These vaccinations contain highly unstable viruses that easily mutate, because they are 'live' 'active' laboratory mutants that are being administered. . . . People shed these 'live' viruses up to three weeks following vaccination. That means if you haven't been vaccinated, and you get near someone who has and then sneezes, you can get their H1N1 laboratory engineered infection." 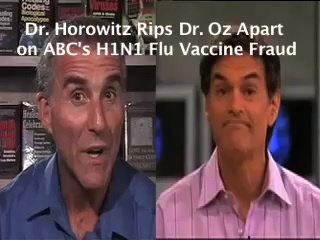 Dr Horowitz also explained that if you get that H1N1 infection after being vaccinated, or become exposed to someone spreading the virus from their injection, you risk recombining that virus with other viruses in your body, or in the environment, such as H5N1 that is circulating. Authorities have been warning that H5N1 kills nearly 60 percent of infected people. 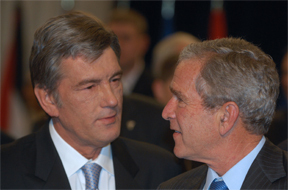 Clearly, President Yushchenko is suppressing intelligence, and using this deadly pandemic, to advance his political career. However, his accusations against his Prime Minister and the Chief Sanitary Inspector, filing criminal charges against them for not recommending vaccinations, leaves him vulnerable to counter claims for reasons stated herein. Dr. Horowitz is known internationally as a vaccine prohibitionist and has defended himself against critics' claims that he is "radical." Over the years, with his many nightmarish predictions having come true, he charges his critics with being part of the problem. "There is no way to 'green vaccines,'" he says condemning those who allege the value of some vaccines. "That's like saying were going to make child safe plutonium." 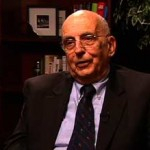 The myths surrounding vaccinations, such as the alleged elimination of polio and smallpox by vaccinations alone, is another major problem according to Dr. Horowitz. Veteran public health professionals credit better hygiene, improved sanitation, water purification, and healthier nutrition for the pre-vaccination reduction of polio and smallpox that government officials neglect to promote a false sense of security in vaccines. "Most people remain ignorant of how powerful and persuasive the media is," Dr. Horowitz explains. "The 'silent majority' is suddenly waking up to the Great Vaccination Deception, including the fact that vaccines exclusively benefit public enemies that fund covert sterilization programs for depopulation, especially the Population Council, funded by the US Government, directly connected to the Partnership for New York City. This is the heart of the vaccine industry. This enterprise advances in the tradition of eugenics--previously called 'racial hygiene' by the corporate fascists that funded Hitler--today called 'genetopharmaceuticals.'" Obama and Yushchenko are both advancing this genocidal agenda. Both presidents criminally neglect the mystery surrounding Baxter's culpability and vaccinations' deadly past history. Both officials criminally neglect the obvious risk of H1N1 vaccines transmitting risky viruses as invitations to deadly mutations, such as what is occurring in the Ukraine. Both presidents rely on fraudulent claims of safety and efficacy of these vaccines. And both presidents neglect outrageous conflicting interests between the vaccine makers and mainstream news sources," Dr. Horowitz says. What is happening in the Ukraine is essentially what is happening here in America. 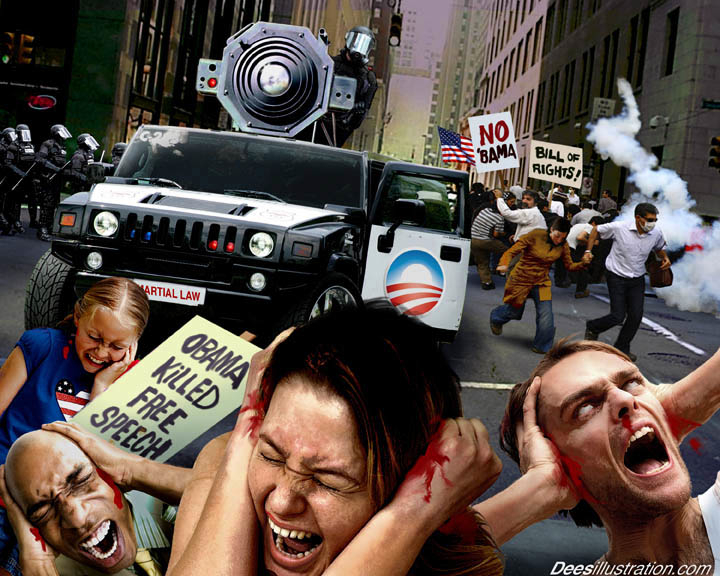 With Barack Obama's H1N1 Declaration of a National Emergency, and with the US Military being deployed in cities to administer "mandatory" vaccinations, we are on the brink of martial law, featuring forced vaccinations and drugs as per the Model State Emergency Health Powers Act, all advancing as planned. Every pandemic in earth's history has occurred synchronously with major socioeconomic and political upheaval. With the long expected, arguably planned, economic collapse, and now nearly 20 percent of the US population unemployed, a bigger deadlier picture emerges; a population control experiment relying on media persuasion and biological and chemical intoxications from vaccinations to protect the status quo and medical paradigm. Hemorrhagic influenza is a most profitable, untraceable, and rapid way to reduce populations threatening global revolution. This unconscionable conspiracy reality is evidenced everywhere with reasonable observers taking notice. Pervasive political corruption and collusion with drug makers is evidenced globally. Risk free, low-to-no-cost, readily available, highly effective, natural cures for infectious diseases, including the most advanced silver hydrosols, are criminally neglected by vaccine advocates and health care reformers. These would be stockpiled by governments, and proclaimed valuable to people, if officials were operating responsibly. As a co-formulator of a leading silver hydrosol, to make his point more clear, Dr. Horowitz insists his product not to be purchased by anyone placing faith in the Food and Drug Administration (FDA) and drug industry, according to notices he has placed on the OxySilver website. Dr. Horowitz laments, "Silver hydrosols should be produced, stockpiled, and distributed by governments to 'We the People.' 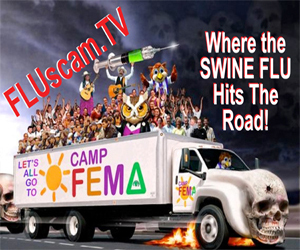 The feds have spent more than $3.5 billion on deadly unprotective swine flu vaccines, Tamiflu, and Relenza. These intoxicating products will cause massive illness and depopulation, as any reasonably intelligent person will conclude by simply reading about their ingredients." Alternatively, he concludes, "if every state simply invested $3 million to build OxySilver manufacturing facilities, as other nations are currently considering, and distributed a gallon of OxySilver to every family this flu season, not only would you protect people most effectively, safely, and inexpensively against infectious diseases, but you would also sincerely address health care reform by putting white collar criminals operating as drug pushers and media manipulators out of business."